Today in Masonic History we present The Ark of the Covenant. 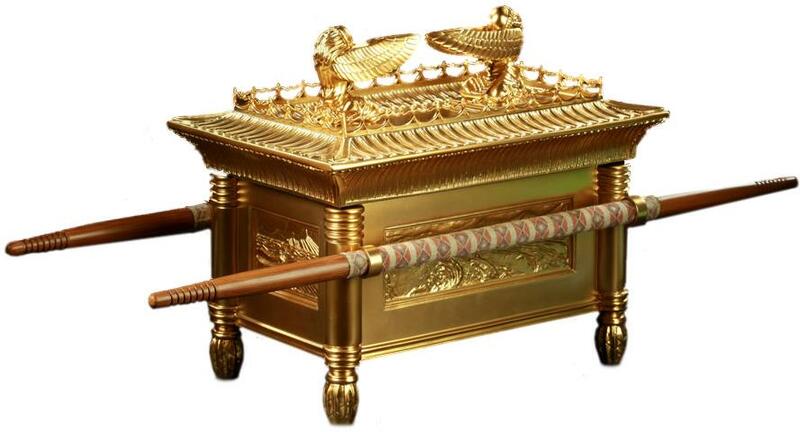 The Ark of the Covenant was housed in the Temple of Solomon. The Ark of the Covenant is a common theme in Freemasonry. It appears as a symbol in a variety of masonic art work. The Ark itself is never mentioned in Blue Lodge ritual. In the Bible it states that after Solomon's Temple was completed, as part of the dedication ceremony the Ark was seated within the Kodesh Hakodashim or Holy of Holies. Within the Holy of Holies two massive cherubims, beings who attend to God in the Abrahamic tradition, stood overlooking the Ark. In the Bible a detailed description is given about what the Ark looked like. Most notably to Freemasons, the Ark in several descriptions is made with acacia wood. The wood was covered with gold and a lid was fashioned with Cherubims on the lid. Despite the detailed descriptions in the Bible, the Ark is often drawn in a variety of ways and shapes. There are at least some who disagree with the idea that the Ark was a box or chest, instead saying it was more of a bowl shape, which would have fit in more commonly with other similiar objects of that time period. Some theologians believe that within the Bible there are multiple arks that are spoken of including the one in the story of Exodus. When Moses smashed the Ten Commandments he placed the broken pieces in the Ark of the Covenant. Also placed in the ark was Aaron's rod and a pot of manna. Aaron, the brother of Moses, was a slave like Moses in Egypt. God proclaimed that Moses was like a God unto the Egyptians and Aaron would be his prophet. Just as Moses had a rod that displayed mystical powers, so to did Aaron. Prior to the Exodus, Moses and Aaron went before the Pharaoh to give him one last change to release the Israelites. To prove God's power, God told Aaron to throw his rod on the ground and that it would turn into a snake. The Pharaohs magicians dropped their rods as well and they turned into snakes, Aaron's rod, now a snake, devoured the other snakes. After the Exodus it was commanded by God that each of the twelve tribes would put forth a rod to determine which tribe would be the priests of the Ark. The tribe connected to the rod that bloomed over night would become the priests. Aaron put forth his rod for the Levities. Over the night his rod began to bloom and almonds came from it. Initially the almonds were sweet. Whenever the Israelites turned away from God the almonds would become bitter. The third item in the Ark, the pot manna was the food source that the Israelites had while wondering the desert. Manna is described in a variety of ways depending on what text you are reading. In later traditions it is said that the Ark was carried before the armies of the Israelites making them invincible. In modern times, the story of the Ark of the Covenant has been viewed through a more modern and even mystical lens. Everything from Indiana Jones and the Ark of the Covenant which had the Ark being unearthed in Egypt and when the Ark was opened the power of God came forth and devoured those who looked upon it. In fact in the Biblical tradition the Ark was hidden from view, even from the people who were carrying it. In other modern twists it has been stated that Moses actually brought down radioactive material from Mount Sinai, and that was why his hair turned white. It is also claimed by the same group of people that priestly breastplate, or high priest breastplate, was meant as some sort of "shielding:" from the Ark. The final resting place of the Ark of the Covenant is unknown. The strongest theory has it in Ethiopia where it is guarded by priests. No one is allowed in to see so it is impossible to confirm that it is the Ark of the Covenant.